The largest carbon fiber consumer over the past several years has been the Wind Energy industry for the production of turbine blades. Aerospace and defense industries, gaseous fuel storage pressure vessels, and sporting goods are also major consumers for carbon fibers and related semi-finished goods. Projections for 2015 show a significant increase in demand from the wind energy industry. While demand by wind energy manufacturers appears to be robust; this industry faces uncertainty due to regulatory requirements, dependence on government subsidies, and fluctuating fossil fuel energy costs. This volatility may shift investment away from wind energy. However, increased demand is expected in the automotive industry. Several major manufacturers have dedicated resources to CFRP utilization in mass produced automobiles. Increased demand is also forecasted for the pressure vessel industry due to emerging marine compressed natural gas transport and storage applications. In 2011 global carbon fiber demand was ~46,800 metric tonnes. 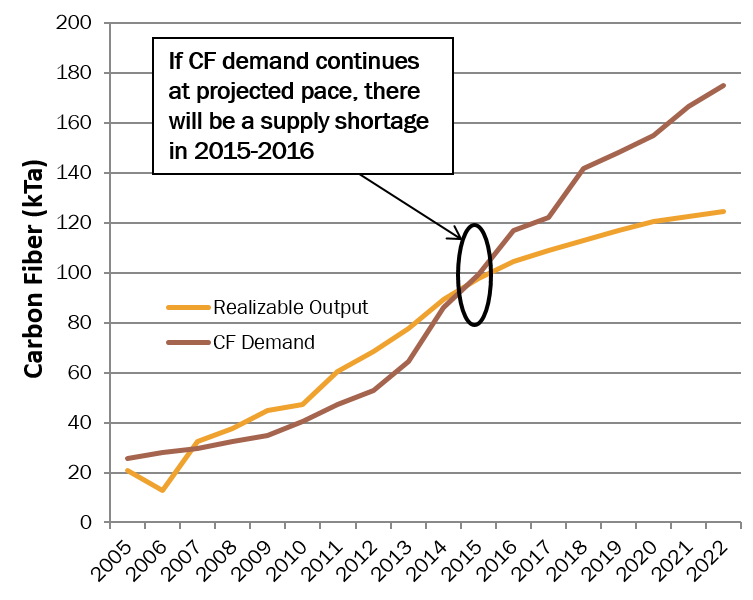 By 2013, demand figures grew 40% to ~65,000 metric tonnes. Successive developments over the next two years (2015-2016) are expected to drive demand up another 80% to more than 118,000 metric tonnes. When this threshold is reached the virgin carbon fiber supply-base is expected to be roughly equal to demand – leading to price increases and limited availability. Boeing estimates that carbon fiber can be recycled at approximately 70% of the cost to produce virgin fiber, using less than 5% of the electricity required (1.3 to 4.5 kWH/lb vs. 25 to 75 kWH/lb). Recycling carbon fiber offers a viable means of extending supplies and stabilizing prices for many cost-sensitive customers. It is notable that the automotive and aerospace industries in Europe face newly implemented, stringent, mandates for material reuse and recycling. The automobile manufacturer BMW has introduced two new consumer vehicle models, the i3 and i8, featuring nearly 300 pounds of CFRP per vehicle—and generating about 60% material scrap. Landfill and recycling mandates imposed upon BMW and all other European manufacturers dictate that 85% or more of their raw materials and 95% or more of end-of life components be recycled, necessitating economical carbon fiber recycling technologies. Without appropriate recycling infrastructure in-place, manufacturers will be unable to meet regulatory requirements for new vehicle production and OEM responsibilities for end-of-life processing.